Amy M. Donaldson works as an Associate Editor at Baker Publishing Group. She received her PhD in New Testament and Early Christianity from the University of Notre Dame. Her recent book, We Want to Believe, was published in April 2011. LibsNote: The interview took place via email with the author, who was contacted via Goodreads. The interview mostly remains unedited, except for the removal of certain clarifying elements or rewording of questions posed that I later realized sounded awkward as hell. All hyperlinks added by LibsLIB and not necessarily endorsed by the interviewee. LibsLIB: Did you have any concerns writing a book about a show that's been off the air since 2002? Amy M. Donaldson: I wasn't concerned that there wouldn't be an audience for the book, since I've remained active in the fandom and know there are still plenty of X-Philes out there. However, until the second movie came out, I wasn't sure that there would be enough interest in the show to sell the idea to a publisher. So, although I had gathered ideas for the book over the years, I didn't give any serious thought to actually writing it until there was news of the second movie. And I didn't start writing the book until I had secured a publisher. 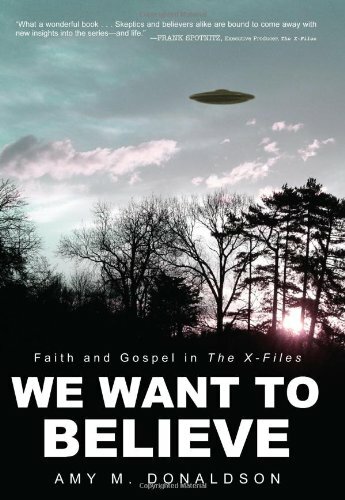 LibsLIB: Why did you feel compelled to write about the religious themes in the X-Files? AMD: I was interested in writing on the topic because it was always one of the things I enjoyed about the show and because it hadn't really been written on before. There's a book on the philosophy of The X-Files and at least two on the science of The X-Files, but as far as I'm aware, all that's been written about religion in the show are a couple of articles. It seemed to me like a very rich topic worth exploring. LibsLIB: Why this show? What does the X-Files provide for you that keeps you coming back to it? AMD: As much as I appreciate the religious themes, for me the heart and soul of the show is the relationship between Mulder and Scully. That's one reason why in my book the chapter on love is one of the longest chapters. But the emphasis on religion, and especially the role it plays in Scully's life, has always intrigued me and earned my respect. Most other shows I've seen that try to address religion have missed the mark in one way or another. But The X-Files treats religion and faith as a normal part of life for intelligent people and presents the possibility that supernatural events are genuine and may be attributed to the divine. LibsLIB: You mentioned the general lack of religion(s) in science fiction, do you think this is an oversight on the part of sci-fi authors? AMD: Sci-fi as a whole (including books and movies, not just television) does not necessarily shy away from religious themes, but sci-fi religion is often more metaphorical or negative rather than a depiction of real-world religion in a true and positive light. That's where I see a distinction in how religion is treated in The X-Files. I think where there is a lack of religion, or even hostility to religion, in sci-fi, it often says more about the authors/creators themselves than about the worlds and people they create. I also think that the lack of human religion I note in Star Trek: The Next Generation and Stargate SG-1 is a trend that has shifted since those shows first aired. Perhaps in that way The X-Files was simply cutting edge or trendsetting. As sci-fi has become more postmodern, there seems to be more allowance for religion and faith. But that religion itself also tends to be more postmodern, such as the syncretistic mix you find in Lost, or focused on the fact of faith (a general sense of spirituality) rather than the object of faith. The X-Files still remains somewhat unique in giving such a prominent position to a mainline tradition like Scully's Catholic faith. LibsLIB: Have you read any other books or seen any other shows that you enjoyed that also had religious and sci-fi elements? AMD: My latest sci-fi interest has been Stargate Universe, which unfortunately just got canceled after only two seasons. There were a number of religious themes introduced in that show, and I was interested to see where the writers were taking these themes, especially since it seemed like such a far cry from how religion was treated in Stargate SG-1. LibsLIB: If you've read it, what are your thoughts on Mary Doria Russell's The Sparrow? AMD: I have not read this book, but I googled it, since you mentioned it. For some reason, sci-fi books don't appeal to me as much as sci-fi television and movies. My father is actually the avid sci-fi reader in my family. Libs LIB: In your book you state, "The counterpart to justice is mercy: not repaying someone the full punishment they deserve. At times, mercy can be just as effective a deterrent as consequences, when the person realizes the price they should have paid and out of gratefulness vows never to repeat the offense." I immediately thought of Jean Valjean in Les Miserables both as a recipient of mercy from the priest and its giver by sparing Javert's life. Why do you think this is a recurring theme in literature/storytelling? Can you think of an example of this occurring in the X-Files? AMD: I love that aspect of Les Miserables and think it is such a powerful story. (I may even have had it in mind when I wrote that sentence you quote!) Honestly, one reason this may be a recurring theme is because it is such a major theme in Christianity and because Christianity has had a major impact on Western literature. However, it is also a powerful theme because it is so contrary to human nature. The very shock of being treated with mercy when you expect judgment can be very compelling—if, like Valjean rather than Javert, you can accept the gift of that mercy and allow it to change you. I think I can see small examples of this theme in The X-Files, but not anything as major and profound as in Les Miserables. One example is in the "Gethsemane"-"Redux" arc, when Mulder kills a man (out of self-defense, although he never seems to argue that point) and fears he is headed for jail, but he is spared prosecution. However, that is more a plot device to save our hero after he has been placed in jeopardy for the sake of a season-ending cliffhanger than it is a message about mercy. Perhaps a more intentional example is the soul eater in "The Gift," who mercifully takes on himself the "death sentence" of others. But the truest act of mercy is by those like Mulder and Doggett who recognize the suffering and humanity of the soul eater and refuse to prolong its pain. LibsLIB: In your interview at The X-Files Lexicon, you stated that you don't believe in aliens. What compelled you to keep watching the show, especially for alien-centered episodes? Are there any paranormal/supernatural phenomena you are inclined to believe in? AMD: Although The X-Files has a reputation for being about aliens, there were really so many episodes that had nothing at all to do with aliens. And even the episodes that did had more to do with the human element in collaboration with the aliens. I also don't believe in Gene Roddenberry's vision of the future, but that never stopped me from enjoying Star Trek. What keeps me watching anything is good characters and a good story. I believe in the supernatural more than in the paranormal. Because my worldview is to see reality as the creation of an invisible and all-powerful God, I also believe that he is capable of doing any number of things that we as finite beings cannot fully perceive or understand. The scientific, and often modernist, mindset of Western culture can sometimes blind us from seeing beyond the tangible, but I think there is more to reality than what we can perceive with our limited five senses. LibsLIB: Who is your favorite character and why? AMD: I identify more with Scully, but I'm not a "Scullyist" in the sense of some fans who prefer her over Mulder. I think the last two seasons of the show prove what a bad idea it is for one of the pair to be without the other. I generally don't enjoy as much the episodes where one of the two is absent (except maybe for "Three of a Kind," just because the Lone Gunmen are so much fun). I love the fact that Scully is such a strong female character who is intelligent without being overly weepy or sexualized. I also love the fact that Mulder has so much respect for her, from day one. I think my main appreciation for Mulder is through Scully's eyes. LibsLIB: What is your favorite way to enjoy an episode (or three) of the X-Files? AMD: I suppose my answer may have been different back in the day, when the episodes first aired. Now, I simply enjoy having the show on in the background while I'm doing other things. But I was never one to have a specific routine, such as turning off the lights and silencing the telephone. In the first season that I watched the show, my roommate and I would record the show and then watch it together later that night when we were both home. Later on, though, I couldn't wait that long—I had to watch the show while it was airing. LibsLIB: The X-Files is famous for "Mulder torture" both in the fandom and the show. Do you have a favorite form of Mulder torture? AMD: I'm not particularly fond of torturing Mulder, nor can I say that I fully understand why some of my friends enjoy that so much. I guess the closest I can come to having a favorite moment is in "Anasazi" when Scully shoots Mulder, for his own good. What's a little bullet wound between friends? just wondering if I can get Amy's email to discuss some of her studies?